There are many definitions that speak about the importance of communication; “foundation of every relationship”, "lifeblood for a successful team” etc. In your role as a manager your ability to function and be successful speaks to how well you are able to communicate. Failure to communicate can not only result in misunderstandings but also in poor performance, low staff morale etc. The best way to improve communication is to establish an organizational culture of opened doors, collaborative sharing and supportive management. Create a safe, healthy environment through an open door policy. Encourage your employees to share ideas, opinions, reccomandations etc. By doing this you are also empowering them as you are including them, listening to them and making them feel valued. An important note during the application of the open door-policy is to do it ethically and in compliance with policies and procedures. Open door strategies sometimes are the easiest to be manipulated and may turn into a gossiping, toe-stepping activity. If you are dealing with complaints, just follow the complaint procedures and avoid informal sharing of information. The open door policy may be one of your multiple entries to opened communication. Sometimes, managers must not just sit around and wait for employees to approach them Take the imitative, walk around, talk to your team, observe, listen. Facilitate a two-way information flow between you and your employees. Horizontal communication is vital in building relationships and creating a climate of openness and sharing. However, it needs planning and strategizing and it does not happen accidentally. The best approach to start your communication strategy is to identify what needs to be communicated. Make a list of standard communication items as: procedures, project information, planned meetings, organizational strategy, goals and objectives etc. For more items ask your team members and add those to your list. Every item must be a piece of information chunked into meaningful and relevant bites in order to avoid information overflow. Customizing and categorizing information accordingly also helps to identify filters and methods to communicate it. For instance the "sensitive items" category must always involve "in person communication" The information is considered sensitive if it has an major impact on one's life or career. Customized information, for instance, a change in the project schedule, may be delivered through email or voice mail and involves only staff that are directly impacted by the change. More on the importance of communication! An important note when using written tools of communication! When using emails, formal letters or memos, always consider that the readers have only their own interpretation filters without visual aids or body language interperation! It's vitally important to communicate clearly. Formal letters and memos are more effective if used to provide details, procedures or to capture a follow-up conversation. Group Meetings/Team Meetings are a wonderful way to maintain horizontal and overall communication. Read more on how to make your meetings beneficial and effective for you and your team. A commitment to always improve communication skills and systems for both managers and staff. A sustainable approach to not only facilitate but also maintain clear and fast communication channels. Enroll to our Empower Through Comunication Ecourse and get immediate access to practical tools, techniques and strategies that will make you a top-communicator! This is a five session E-course that will be delivered to you via email. It includes visual resources, templates and communication skill builder exercises. 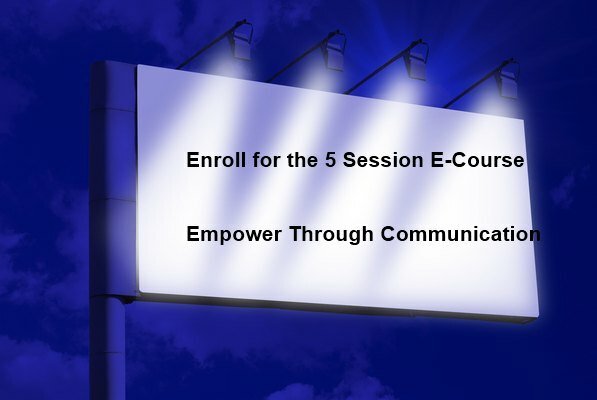 Empower Through Communication E-course - A lifetime resource to empower yourself and others. Copyright© 2008-2017 Management Skills Advisor. All rights reserved.